The headlines these days are full of projections and reflections for the Phoenix Metropolitan Area resident real estate market. 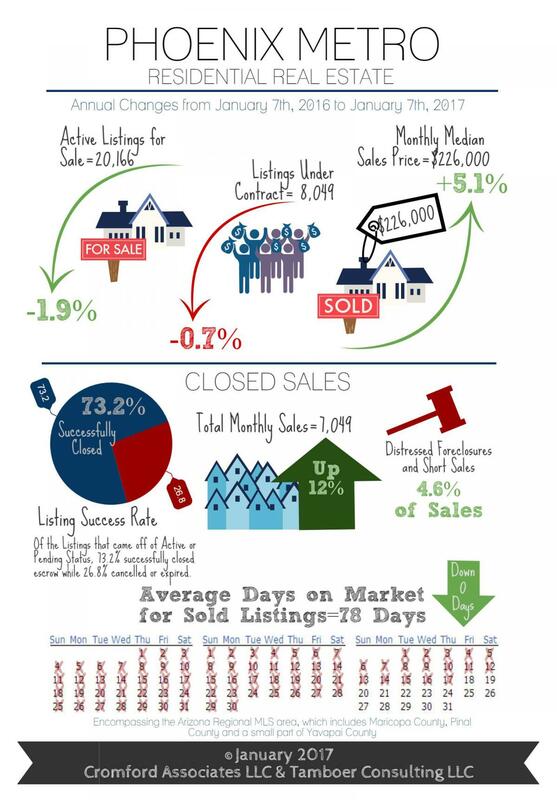 All together the Anthem, Desert Hills, Scottsdale and Phoenix real estate markets had a great year! To complement our monthly measures here are some year-end numbers to reflect on. Looking forward in the short term, the market can expect more buyers emerging with improved credit scores as we move farther away in time from the foreclosure and short sale crisis. Recent announcements regarding FHA loan limit increases and lower mortgage insurance premium fees signify a loosening up in lending that will contribute to more demand for listings under $300,000. Higher interest rates will cause some buyers to purchase smaller homes than they anticipated, putting even more pressure on the market under $300,000; which is already short of supply for existing demand. With nearly 73% of all sales in this price point, it’s reasonable to expect appreciation to continue to be positive for the Phoenix Metropolitan, Anthem, Desert Hills, Scottsdale and Phoenix real estate marketsoverall. If you’re interested in purchasing or selling a home you can start by Contacting Us directly or start searching for your new home here – Anthem, Desert Hills, New River, Phoenix, Mesa, Scottsdale, Tempe, Glendale or Surprise. There’s both good and bad news for first-time home buyers this month. The good news is that there’s been a 22% increase in single family active listings asking between $175,000-$200,000 over the last 10 weeks, going from 1,065 to 1,295. Current inventory is 10% higher than where it was in week 49 of last year, adding some much needed choice to a high demand price range. The added supply is not universal across the valley; increases have been marked specifically in Buckeye, Surprise, Sun City, Peoria and Mesa. The bad news for home buyers is that supply overall is down 3.7% while the level of competing buyers is remaining seasonally consistent. The Southeast Valley specifically has not seen the typical increase in supply that happens this time of year. This indicates that the area will kick off 2017 with low supply just before the expected increase in buyer activity come February. In this case, the cost of waiting to purchase will be a lack of choice and possibly having to compromise on the condition or location of the property they choose to buy. Bad news for buyers usually translates into good news for sellers, especially after positive news reports of Realtor.com ranking Phoenix as the #1 projected real estate market in the country for 2017. However, it’s still not a market to be overpriced regardless of the strong demand for homes. Some price ranges have more competing listings than others, especially in areas such as North Phoenix, Mesa, Gilbert and Peoria where there is competition from new home subdivisions. Permits for single family homes have been on the rise to accommodate the demand. This provides more choice for buyers in those areas, balances out the market and keeps annual appreciation in check. The areas projected to have the highest appreciation rates are those where there is a high level of fix and flip activity along with a more affordable price range under $175,000.